Chito Fuentes, shared facts about President Rodrigo Duterte’s journey when he was still the Mayoof Davao City and how opposition trying to destabilize Duterte. According to Fuentes, president Duterte supported the previous administrations, since the time of late former president Cory Aquino until his son Noynoy Aquino. Fuentes described the action of the opposition as ‘Faustian bargain.’ Because they would do anything just to bring down Duterte. He said Duterte supports from the past but in return, he got destabilization plot from the opposition. He said the opposition makes a move just to malign, humiliate, and embarrass the President. "When President Rodrigo Duterte was first elected mayor of Davao City in 1988, the President was Corazon Aquino. 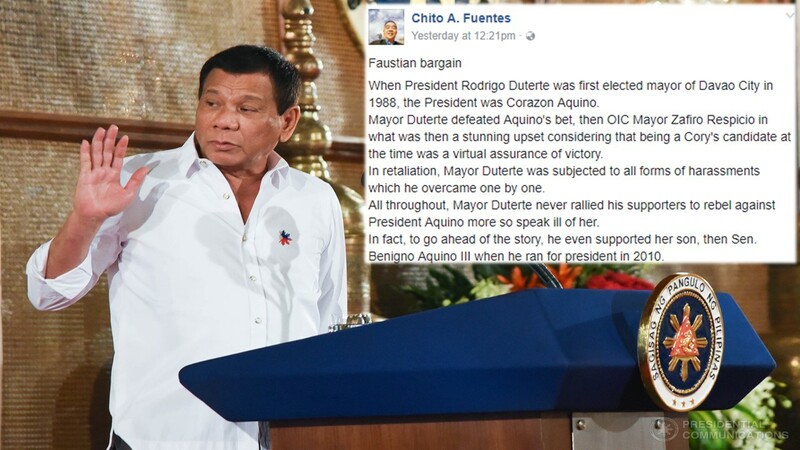 "Mayor Duterte defeated Aquino's bet, then OIC Mayor Zafiro Respicio in what was then a stunning upset considering that being a Cory's candidate at the time was a virtual assurance of victory. "In retaliation, Mayor Duterte was subjected to all forms of harassments which he overcame one by one. "All throughout, Mayor Duterte never rallied his supporters to rebel against President Aquino more so speak ill of her. "In fact, to go ahead of the story, he even supported her son, then Sen. Benigno Aquino III when he ran for president in 2010. "During the term of President Fidel Ramos, Mayor Duterte declined an offer for him to serve in a national position but supported Ramos all throughout. "When President Erap Estrada won in 1998, Mayor Duterte was again offered a national position which he again declined. Like Estrada's predecessors, he gave the national government the respect and support due it. "After President Gloria Macapagal-Arroyo assumed office in 2001 as a result of EDSA 2, she supported then Mayor Benjamin de Guzman against Mayor Duterte who defeated his former ally. "In spite of this, Mayor Duterte humbly declined GMA's offer to be her anti-crime czar but expressed his desire to serve as adviser because he didn't want this to affect his duties as mayor. "As mentioned earlier, Mayor Duterte supported PNoy not only during the election but until late into his term. As proof of this, he was even considered as running mate of yellow standard-bearer Mar Roxas although it was doubtful if the consideration was sincere. "What is the point of this narration? "All throughout his tenure as OIC vice mayor, mayor, congressman, mayor, vice mayor and mayor, President Duterte gave the national government and national leaders the respect due them. "But now that he is president, he is being maligned, humiliated, embarrassed, spit upon, cursed and what-have-you by people who shamelessly present themselves as educated, cultured, sophisticated and (oh how they have redefined this word) decent. "By this time, is it becoming clear that the reason for all the filth they throw against him is not so much about what President Duterte is doing (which 80% approve of as we know) but their evil desire to remove him at all cost. "According to an Elizabethan play, Faust traded his soul to the devil in exchange of 24 years of immortality hence the expression "faustian bargain". "There are people who would not mind if the Mautes terrorize the whole country, if drug and crime syndicates run the government, if calamity strikes the land, anything, if this would bring down President Duterte. "Tell me if this is not striking a faustian bargain with the devil.